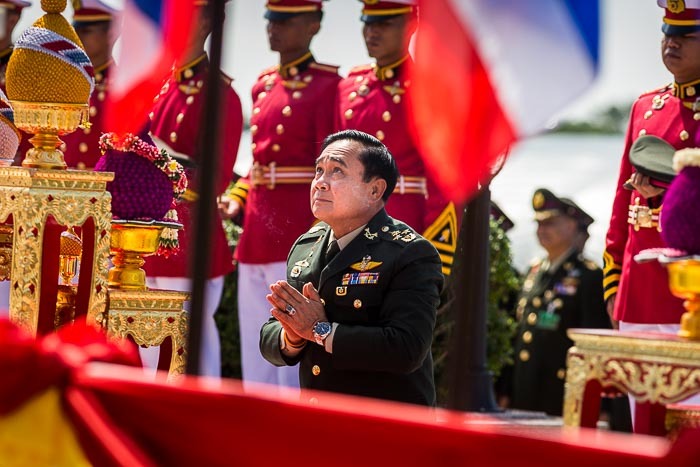 Gen Prayuth Chan-ocha, the commander of the Royal Thai Army (RTA), prays during the retirement ceremony for more than 200 Thai generals at the Chulalomklao Royal Military Academy. 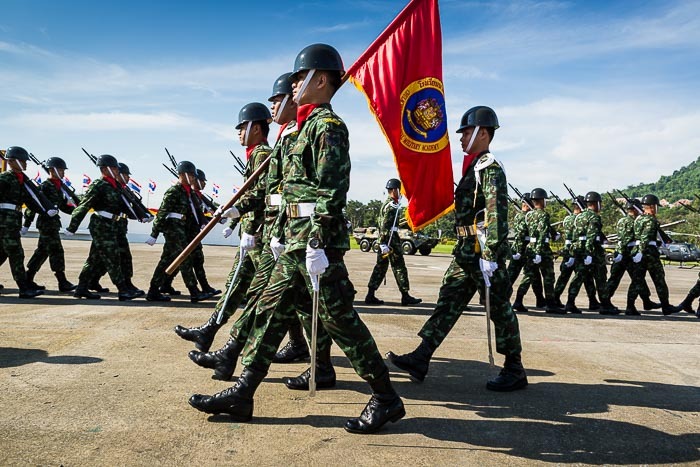 The mandatory retirement age is 60 years old for military officers in Thailand. Since so many officers stay in the army as a career and promotions happen on a regular basis, it means that every year hundreds of generals retire. Generals and senior officers stand for the national anthem during the military retirement ceremony. This year was no exception. What was exceptional about this year's retirement ceremony was who retired. 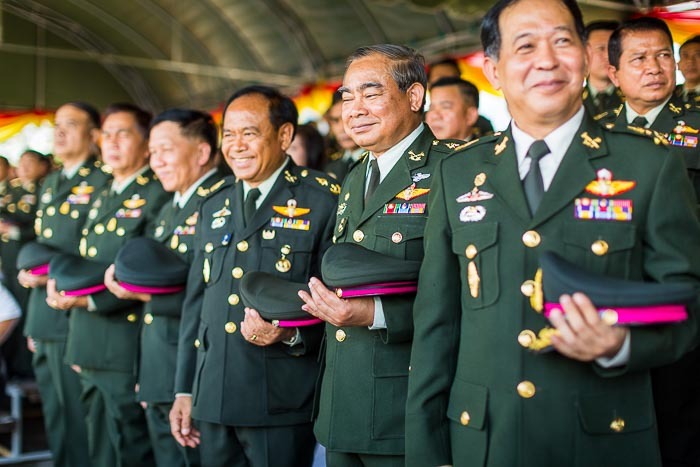 Gen. Prayuth Chan-ocha, commander of the RTA, and instigator of the coup that unseated the civilian government, was one of the 200 retiring generals. 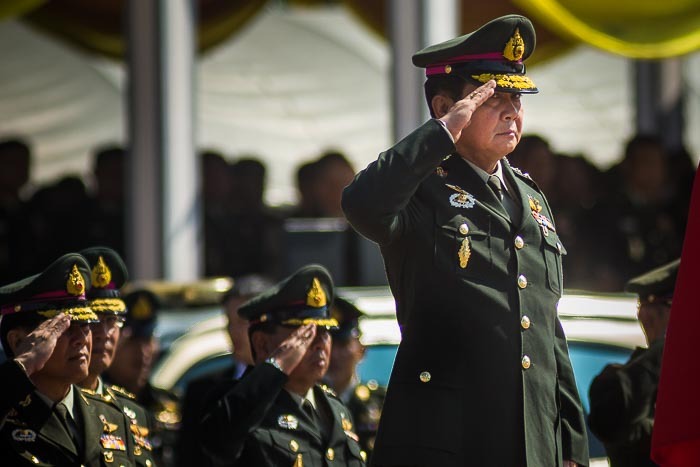 Prayuth is retiring from the army but not from public life. 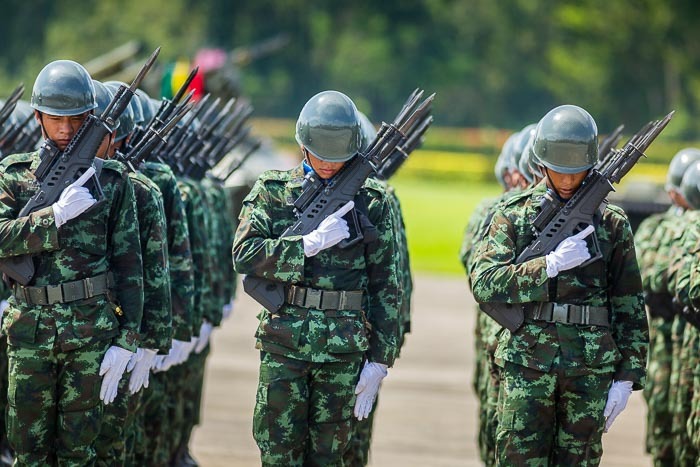 He is staying on as leader of the National Council for Peace and Order (NCPO), the junta that runs Thailand and he was recently selected as Prime Minister by the National Legislative Assembly (NLA), the legislative body appointed by Prayuth and the NCPO. Generals walk into the retirement ceremony, which featured a large military parade. General Prayuth started the ceremony with a review of Thai soldiers. There was a prayer and merit making at a statue of King Chulalongkorn. King Chulalongkorn, also known as Rama V, is a revered Thai monarch who is credited with both holding British and French colonizers at bay and kicking off the modernization of Thai society. Rama V founded the military academy that hosted the retirement ceremony. 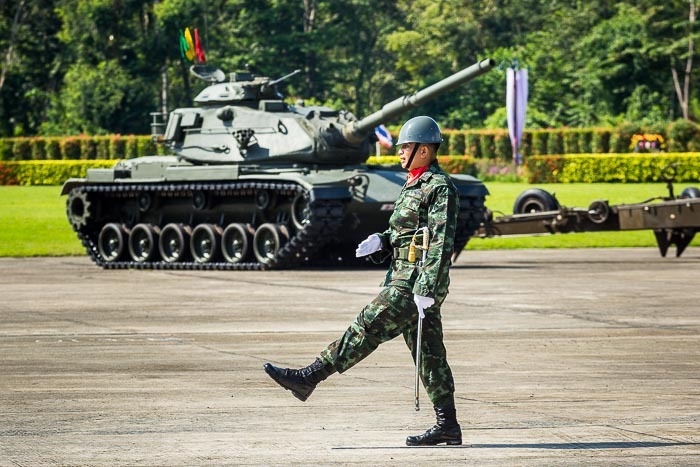 A non-commissioned officer marches past a parked tank at the beginning of the parade. 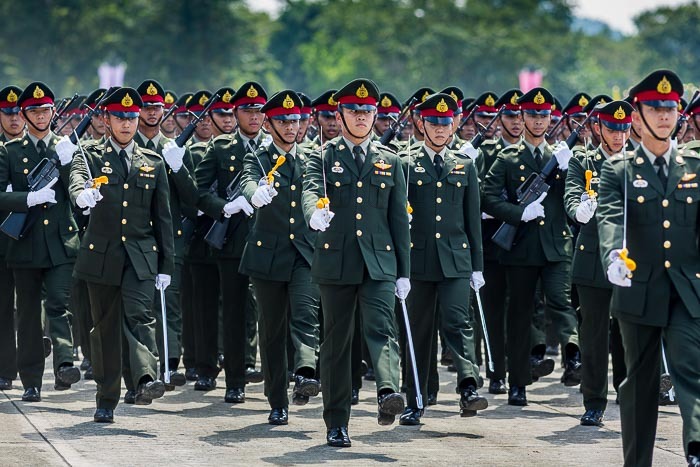 Soldiers march across the parade ground during the retirement ceremony. 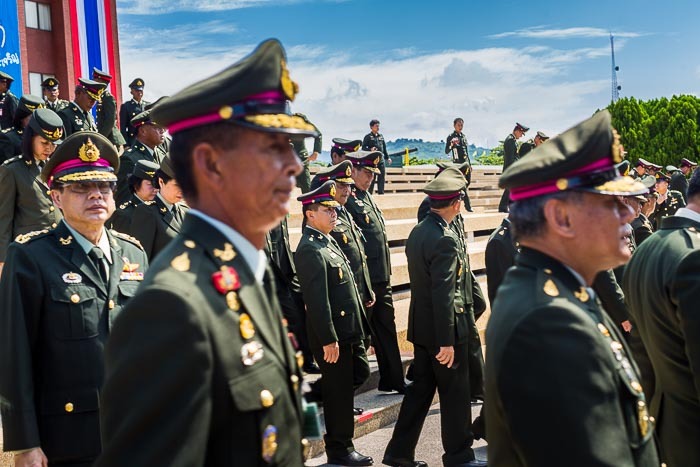 General Prayuth reviews the troops. Soldiers with Tavor assault rifles, designed in Israel. The RTA used to use a lot of American equipment from the 1911 Colt .45 handgun to the M16 family of rifles to M48/M60 tanks. They've diversified their suppliers and now have handguns from Italy, rifles from Israel, tanks from Ukraine, armored personal carriers from South Africa. There was a lot of media attention to this year's retirement ceremony, primarily because of Gen Prayuth's retirement. There are more photos of the ceremony in my archive or available from ZUMA Press.